“One of the key challenges for radically improving young people’s mental health is how to research, design and develop interventions that are not only evidence-based but engaging for young people.” (from the guide). 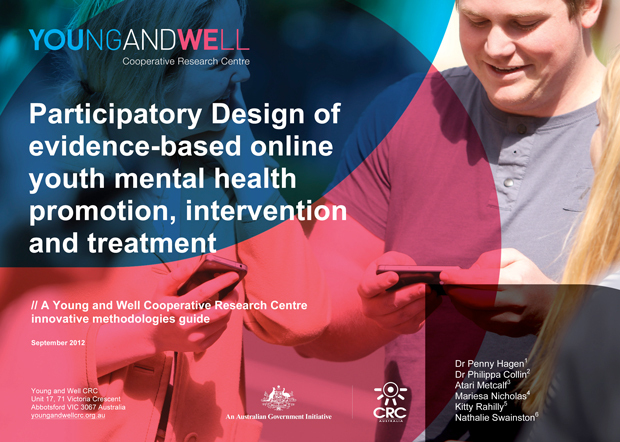 Earlier this year I had the privilege of working with the amazing team at Inspire and the Young and Well CRC on their first Innovative Methodologies Guide: Participatory Design of evidence-based online youth mental health promotion, intervention and treatment. Officially released today the guide aims to support researchers, policy-makers and the youth, health and community sectors to involve young people in the development of online services and activities designed to improve young people’s mental health. The guide provides a framework to support the integration of different forms of research and participation throughout the design process (within the broader research context) as well as specific methods, examples and case studies and hopefully will be a resource that can be built upon. The contents of the guide actually reflects years of brave, ground breaking work by many researchers, designers, technologists, mental health professionals and, of course, inspirational young people. It was fantastic to be a part of evolving the intersection between participatory design and youth mental health and to have the opportunity to visualise a participatory, evidence-based approach to design. Thanks too goes to Shaun Lee and Ludwig Wendzich of Lee Ter Wal for info graphics. See the Young and Well CRC site for more details and to download the guide.